Ladies kilts are really in fashion at the moment! Billie Kilts are great for wearing every day but they are also becoming popular for wearing to your favourite music festival or sporting event. 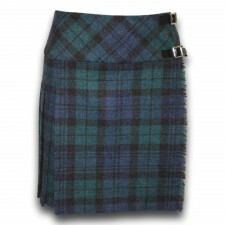 If you are looking for a tartan skirt or a plaid skirt, our Kilts for women are a great option. Available in sizes UK 8 - UK 20 and in Black Watch, Royal Stewart or Heritage of Scotland you can guarantee that these kilts will make you stand out from the crowd. All are fantastic quality, machine washable and at great prices too, a great buy especially popular with those going to any Scottish festivals, Scottish Rugby and Football Matches. We also stock a range of Girls Kilts.